IT Moves to a Utility Model (Wikibon Report) | What's The Big Data? Amazon has turned the data center into an API. 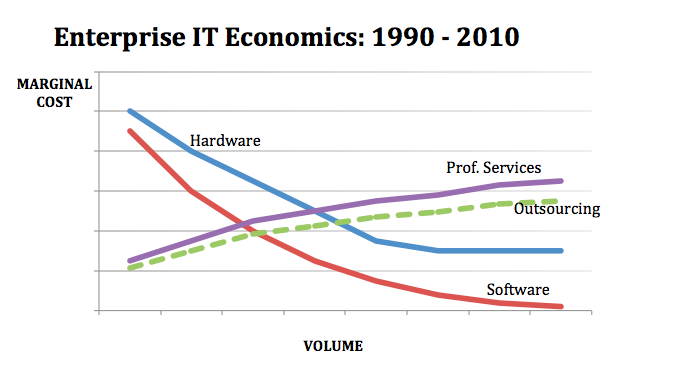 This trend is having profound impacts on enterprise IT customers. In particular, the economics of infrastructure outsourcing (i.e. deployment, provisioning, management and orchestration), which formerly had negative economies of scale at volume, are beginning to track software marginal economics – i.e. incremental costs go to $0. To compete with these cost structures, IT organizations and competitive cloud vendors will have to either have massive scale or become highly vertically integrated… CIOs should plan to expend labor for managing IT infrastructure only in cases where it drives direct profit. Otherwise, technology organizations should focus resources on integration and adding differential value through analytics, new services and unlocking innovative digital business technology models. This entry was posted in CIOs, IT, IT industry. Bookmark the permalink.